A music studio equipment manufacturer had problems maintaining steady pressure with their compressed air system. Additionally, there never seemed to be enough air to meet production demand despite having both a 50 hp and a 75 hp rotary screw compressor. Month after month, energy costs soared with the compressors being the highest consumers. And during the summer months, increased condensate in the lines caused severe air quality issues. An Air Demand Analysis (ADA) revealed that the 50 hp unit (with modulation control) was producing only a fraction of its total capacity yet consuming full load kW. 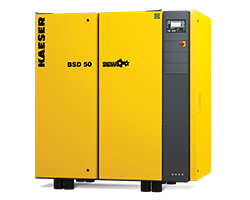 A single 50 hp compressor with adequate storage could easily meet the plant’s demand and provide significant energy and maintenance cost savings. The air quality issues were due to undersized storage and air treatment. The new, energy-efficient 50 hp dual control compressor provides all the air that’s needed and keeps the plant pressure rock steady—with the 75 hp compressor still there for backup. The new refrigerated dryer with energy-saving controls and condensate management system have solved the air quality issues, while the 361,099 kWh reduction in annual energy consumption has this customer singing a happy tune. If you’d like more information on compressed air audits, click here to download our complimentary whitepaper.